Vasquez Heilig, J., Cole, H. & Springel, M. (2011). 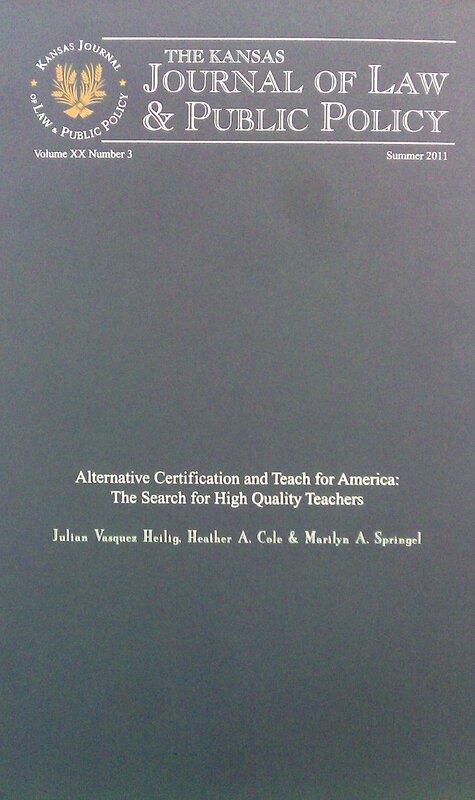 Alternative certification and Teach For America: The search for high quality teachers. Kansas Journal of Law and Public Policy, 20(3), 388-412. At a time when accountability leads almost any discussion within or about the education sector, it is a disconcerting irony that we continue to require more and more out of students in terms of skills, performance, and results, but less out of their teachers. The policy disconnect cannot be ignored. Now is the time to elevate the teaching profession, not dismantle it. Men and women entering the profession via TFA should do so not as a short-term stepping stone to other vocations—but because they feel a long-term calling and a commitment to dedicate a career to teaching. Sometimes reform needs reform. Teach for America started out as something good and morphed into something bad for education when the big money came their way. Now it is used as a calling card to certain corporations and to eliminate high time experienced teachers who are about to vest in lifetime benefits and such at the top of the pay scale. It is totally blatant in the way it is done. They do not last very long. Why would you go to an ivy league college with those costs for a low paying job unless it is to prevent paying to work, intern. It is better to get TFA on your resume and get paid something and they go get the good job. Districts today use flexability, interfund transfers, RTI and TFA to try to balance their budgets. This is happening everywhere. Everything is a percentage and that is how they look at it. Illegal or not, who cares, just do it. Fire teachers without due process, falsely charge them with crimes, replace them with TFA, who cares, just do it. Students, you are nothing more than revenue generators for us to pork our friends. And make sure that you realize that Obama and Duncan along with the republicans are behind this. As a friend of mines grandfather taught him “I hear real good, but I see a whole lot better.” Just watch what they do not what they say.